This blog revolves around my interest in organizations and interfaces that change behavior. With that broad topic, I’ve been able to slide around to pretty much anything I’ve read that interests me. I’ve pushed out about 70 posts since I started in late August, of varying qualities, lengths, and amounts of original content. There have been some common threads that my posts have hit. If you’re only interested in one thread, maybe this can help. I write a lot of disparate notes in the same posts, though, but you’ll have to dig to get at any of those for now, sorry. Most of my posts are not represented here, including ones I’m pretty fond of. EDIT: Since I last updated wordpress, my fonts have apparently been going nuts. I’m not sure what’s up with that. Expecting more from ecological DownWings. Had too much fun with the Dark Enlightenment guys. I started writing UpWing stuff but mostly explicitly UpWing writers bore me with their familiarity. Gradualist view of driverless cars, an attempted embrace of total surveillance states. Singularitarianism, accelerationist, happy stuff. Prereqs: Notes on Historiography mentions Spengler and other historians I took an interest in this year. Wrote all of this in early October 2013. I got into Spengler through John Greer’s blog. Greer is a fascinating DownWing author has been a fount of resources on certain strains of thought. Inspired by Ribbonfarm’s 2013 guests (mostly Mike Travers and Kevin Simler, although I liked all of the guest writers), I started looking into “Parliamentary Minds” and “Bicameral Mind” threads of thought, which I was mostly familiar with through Daniel Dennett and Douglass Hofstadter before. Posts responsible for a lot of the vocabulary I use. Developing Organizations(Forced Moves/Good Tricks and the TIMN framework- a recurring framework in this blog). Kludge(defining problems with complex bureaucracies- a recurring theme in this blog). The oldest thread in this blog was on a nonlinear view of history and technology. There’s some idea development going on in short bursts here, based on readings I enjoyed. This is some longer stuff I tried my hand at earlier, but will probably be retreading soon because they were sloppy, too-early draft attempts. Aeon Magazine on Creepypasta/Weird Fiction. I riffed on Weird Fiction once a few months ago now, it’s a fun an interesting subject that presumes a chaotic, unknowable, uncaring universe, and is usually a powerful foil to the human-aggrandizing Science Fiction genre that I also adore. A more telling aspect is the preponderance of those ‘lost episode’ and ‘haunted software’ riffs. Stories in that mould proliferate like Japanese knotweed, to the extent that the Creepypasta Wiki no longer accepts them. Are they a product of the web’s innate tendency towards pop-cultural nostalgia, or something else? A generation or two that grew up saturated in children’s TV and computer games might now be wondering about the deeper effects of that immersion on their adult minds. Those of us now in our 30s and 40s are pioneers in that mental space, and are being followed by more hardened cohorts. Part of our generational project, in art and life, will be to explore what that saturation has meant. In this, creepypasta is ahead of a good deal of high art and literature. Furthermore, creepypasta scratches at the unspoken deal made between children and adults. If all is well, the horrors that surround us during childhood are suppressed, and we discover them only as we approach adulthood. Maturity brings the realisation that frightful stuff had been going on around us all the time — so why not possession and mass suicide as well as the usual death, disease and strife? Meanwhile, adult minds have fashioned supposed amusements that, to the child, can have awful gravity, as anyone who remembers the nightmare figure of Noseybonk from the 1980s BBC TV programme Jigsaw can attest. As for the haunted attachments, games and files, our use of networked computers is daily coloured by fear of infection and corruption, of predators and those who would assume our identity, of viruses and data-sucking catastrophes. What if something dark is able to breach that all-important final firewall, the gap between the central processing unit and the person sitting at the keyboard? What if it already has? That would be ‘a malign and particular suspension or defeat of those fixed laws of Nature which are our only safeguard’, without a doubt — but the unplumbed space haunted by demons and chaos is the network, not the cosmos. In using the internet to creep ourselves out recreationally, we begin to understand the real ways in which it haunts our fears. Our use of money is infused with profound cultural and political meaning, and the interplay of rival currencies can offer insights into cultural tensions. This was as true of post-Soviet Russia as it is of Bitcoin today. The anarchic virtual currency is part of a wider cultural movement that embraces technology, and replaces institutions with networks. The long-term impact of this transformation may be even greater still, a resilient non-institutional currency could form the bedrock for a wider transnational identity. I explored Bitcoin personally in late October, trying a mining pool and buying in at an exchange. I mostly cashed out before the big drop when China pushed away from it (got lucky). I still have some holdings of BTC, LTC, and DOGE, just for fun. I’m still very interested in this idea of a “distributed autonomous company”, but there’s not much substantive out there. Old but good. I was discussing this with some friends recently: Michael O’Church on the 3-Ladder System of Social Class in the US. Typical depictions of social class in the United States posit a linear, ordered hierarchy. I’ve actually come to the conclusion that there are 3 distinct ladders, with approximately four social classes on each. Additionally, there is an underclass of people not connected to any of the ladders, creating an unlucky 13th social class. I’ll attempt to explain how this three-ladder system works, what it means, and also why it is a source of conflict. The ladders I will assign the names Labor, Gentry, and Elite. My specific percentage estimates of each category are not derived from anything other than estimation based on what I’ve seen, and my limited understanding of the macroeconomics of income in the United States, so don’t take them for more than an approximation. I’ll assess the social role of each of these classes in order, from bottom to top. Markets. “How the Economic Machine Works” was fun, and uses some common metaphors to easily illustrate the concept. The “machine” metaphor certainly invokes more certainty than is warranted, I guess. Institutions. “Don’t Mistake This For Gridlock” is counter to previous writers I’ve shared who are more critical of our political entrenchment. Of course there’s also the “This *is* Gridlock but Gridlock is Good” school, as well, a conservative school of thought about government action that’s especially reasonable-sounding during times of evident polarization. Tribes. “The Culture that Gave Birth to the Personal Computer” by Walter Isaacson. Why haven’t I seen Stewart Brand being portrayed in a movie? Even more animal cognition. I admit to quoting perhaps half of the article here. But the other half is also quite pretty, and worth a read. […] I confess I am astonished at how much mammalian brains resemble one another in their organization, architecture, and complexity. Just as human beings possess only a marginal genetic difference from the next “lower” order of primate–all our languages, sciences, tools, and arts the result of this smidgen of code–it appears that the raw matter of thought and perception is, neuroanatomically, subject to only minor variations in organization. But considerable differences, I notice, in developmental emphasis. That is, animal brain MRIs, compared to human brain MRIs, show strikingly “superhuman” development in selected areas. We have known for centuries that elephants have long memories; the hippocampus is the seat of memory in human beings; the elephant brain looks like a human brain, only with the most gargantuan (the most elephantine) hippocampus imaginable, which is in turn intensely crinkled and convoluted. (Which means there’s a greater surface area, and hence more “processing” going on there.) On that scan, the hippocampus was the place my radiologist’s eye jumped to as I realized—slowly—that I was not looking at a human brain. My first radiological impression, though, was one of familiarity. Similarly, the olfactory bulb, responsible for the sense of smell, is several times larger in dogs compared to humans, as you would expect. The orca happens to have an extremely crinkly (compared to us) limbic and paralimbic area, two areas which in mammals process emotion. This superhuman development correlates well with the behaviors of orca pods and human families. Human families fragment when the young reach adulthood, with the young splitting off and starting new families of their own, sometimes in farflung cities. The pair bonding between the father and mother may break down well before that (we call this “divorce”). Among orcas, adults never leave their mothers; everybody travels together, and apparently each pod has its own language—a well-known communicative prowess that may relate to its unusually well-developed operculum. There may come a time when we cease to regard animals as inferior, preliminary iterations of the human—with the human thought of as the pinnacle of evolution so far—and instead regard all forms of life as fugue-like elaborations of a single musical theme. “The Internet exists so people can make me seem more coherent and insightful than I actually am.“-Adam Gurri on my post on Probabilistic Minarchism, where I condensed his articles separated by weeks (and other articles) into a single topic post. Something about this. Not sure what. This idea certainly makes sense (without insulting the intelligence of the people involved, of course). I think I’d like to work on impromptu speaking next year? Not relevant to any thread I’ve been running with recently, but Greer wrote about Wolfram lately. In “An Old Kind of Science” (lol) he argues that the narrative of “Man: Conqueror of Nature” is a recent one, born long after the establishment of secular science and raised by the exploitation of “fossil sunlight” into the dominant historical narrative. Trapped by this story, we have developed a tendency to confuse our territories with our maps, to mistake our concepts for the definite truth instead of as useful descriptors, and to view the ultimate and inevitable aim of science as the total deliberative manipulation of nature. Wolfram’s “new method” is in fact based an older way of viewing knowledge: instead of dealing exclusively with programs dictated and designed to perform a purpose for man, he wants to allow for arbitrary programs to naturally develop and observe how they behave. That’s the heritage of science as a quest for power over nature: like all other machines, computers are there to do what human beings tell them to do, and so computer science tends to focus on finding ways to make computers do more things that human beings want them to do. That same logic pervades many fields of contemporary science. The central role of experiment in scientific practice tends to foster that, by directing attention away from what whole systems do when they’re left alone, and toward what they do when experimenters tinker with them. Too often, the result is that scientists end up studying the effects of their own manipulations to the exclusion of anything else. Consider Skinnerian behaviorism, an immensely detailed theory that can successfully predict the behavior of rats in the wholly arbitrary setting of a Skinner box and essentially nothing else! The alternative is to observe whole systems on their own terms—to study what they do, not in response to a controlled experimental stimulus, but in response to the normal interplay between their internal dynamics and the environment around them. That’s what Wolfram did. He ran cellular automata, not to try to make them do this thing or that, but to understand the internal logic that determines what they do when left to themselves. What he discovered, to summarize well over a thousand pages of text in a brief phrase, is that cellular automata with extremely simple operating rules are capable of generating patterns as complex, richly textured, and blended of apparent order and apparent randomness, as the world of nature itself. Brooks goes uncharacteristically dark/personal in “The Thought Leader. Not sure how much of it is autobiographical. I think I want to write up some kind of glossary or a cowpath of post links. Some new readers expressed some bewilderment at what goes on around here. I’m late to reading this, but since World War I is approaching its centennial: “The Rhyme of History“. Also hitting its centennial: Carnival at Carnegie Mellon. Something fun: “Why the Web Won’t Be Nirvana” (Feb 1995). Mike Travers’ last guest post on Ribbonfarm: “Morality for Exploded Minds“. Likely new themes to introduce in the future (weeks scale): Games Studies, Gamification, (Post-)Work. EDIT: Jordan Peacock’s notes on “Surfaces and Essences“. Two “Edge” responses on a useful idea. 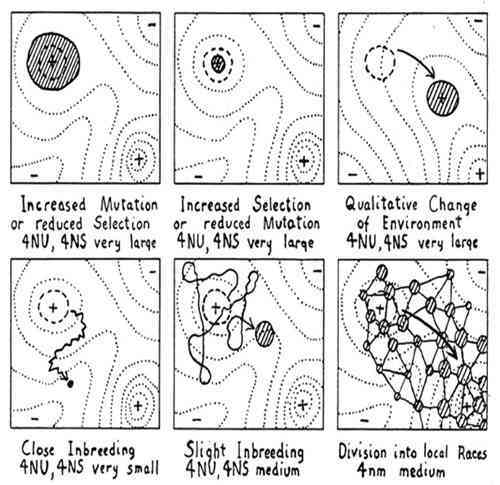 The first two illustrate how low selection pressure or a high rate of mutation (which comes with small populations) can broaden the range of a species whereas intense selection pressure or a low mutation rate can severely limit a species to the very peak of local fitness. The third diagram shows what happens when the landscape itself shifts, and the population has to evolve to shift with it. The bottom row explores how small populations respond to inbreeding by wandering ineffectively. The best mode of exploration Wright deemed the final diagram, showing how a species can divide into an array of races that interact with one another. That jostling crowd explores well, and it can respond to opportunity. Fitness landscapes express so much so economically. There’s no better way, for example, to show the different modes of evolution of a remote oceanic island and a continental jungle. The jungle is dense and “rugged” with steep peaks and valleys, isolating countless species on their tiny peaks of high specialization. The island, with its few species, is like a rolling landscape of gentle hills with species casually wandering over them, evolving into a whole array of Darwin’s finches, say. The island creatures and plants “lazily” become defenseless against invaders from the mainland. You realize that for each species, its landscape consists almost entirely of other species, all of them busy evolving right back. That’s co-evolution. We are all each other’s fitness landscapes. I know that those few of us actively involved in the struggle are deeply worried about the epidemic of excellence precisely because excellence compels its hosts to facilitate its spread by altering their perception of its costs and benefits. Most educated people have come to revere the spending of the fabled ‘10,000 hours’ in training to become respected jacks of one trade. Large numbers of Americans push their inquisitive children away from creative play so that they can excel in their studies in hopes they will become excellent candidates for admission to a center of excellence, to join the pursuit of excellence upon graduation. B) Crossing—Genius. Crossing the ‘Adaptive Valley’ to an unknown and unoccupied even higher maximum level of fitness. C) Moving—Heroism. Moving ‘mountains of fitness’ for one’s group. A survey of Adam Gurri’s conception of Probabilistic Libertarianism and a permissionless society. There are inherent problems when talking about ideal governance arrangements, of course, which may be why Taleb has mostly avoided it—reality constrains you both by how hard it is to get to where you want to be from where you are, and by what you would set in motion if you were even able to get to your ideal. I might also aside here and say that Gurri’s ability to make the claims he makes in his articles don’t just speak to his own insight but also to the brilliance of Antifragile, which only really enjoyed a lukewarm response from a lot of reviewers that I respect. I thought Antifragile was masterfully written, such that I got some sense of a characterized fiction-Taleb, one whose response to the news I could probably predict, since I had some sense of his preferences and aversions. I know how this character likes to eat and exercise and what he would likely think about issues that weren’t touched on in the book. I think this is what Taleb was attempting first in smaller doses with his earlier characters like Fat Tony. I thought his asides made some sort of sense in inundating the reader with this idea so that it wasn’t just restricted to “this economic idea” in the Econ container of the mind. Anyway, Gurri argues that Taleb would likely be a Minarchist, but for “probabilistic” reasons instead of any of the classical Minarchist arguments. The argument of the book Antifragile is that when you have a lower bound on bad outcomes, volatility can only be good for you, as the most extreme variation can only occur in the direction of good outcomes. As such, it should not come as a surprise that Taleb believes in a strong government role for bounding us against tail risks such as being conquered, having a rogue GMO wipe out all of agriculture, or permanently damaging the environment. Other than that, he believes that our policies should be as libertarian as possible. Bound the negative outcomes, unbound the positive ones; often the opposite of what governments actually do today. At first glance this appeared even more extreme than your typical minarchism, as minarchists also believed in a role for the state in protecting property rights and policing violent crimes. Here, Taleb is not anarchist but rather something like an extreme federalist; such things should be left to local governments. Indeed, if Antifragile is any indication, it should be even more local than we are presently willing to consider; we should be more like the Swiss, atomized into a large number of tiny cantons run on the basis of direct democracy. This is another way of bounding negative outcomes—any extremely bad local policy can only have an impact on a very limited number of people. I looked around for more on Probablistic Minarchism, but (by that name, anyway), no one really expounds on the concept. So I returned to the author, Adam Gurri. Sure enough, that was not the first time he mentions probablistic libertarianism or connected Taleb to the philosophy. Adam Gurri recently posted the question “What is government?” in a recent his Umlaut column. There is no true central decisionmaking agent known as “government”. There is an ecosystem of institutions that are funded entirely with tax revenue, which is collected under the threat of force. The diversity of these institutions cannot be understated—common law courts have a history dating back centuries, perhaps millenia. The Department of Homeland Security, on the other hand, can claim just over a decade, and it ropes together a group of institutions supposedly under its direction that predate it by decades. As with “government”, calling this hodge-podge “the market” or “civil society” is not very informative. These categories are so broad as to rarely be very meaningful; we would do better to delve into the strengths and weaknesses of the specific institutions we have in mind. Which is a point I’m surprised I haven’t really stumbled through thus far. In his August article “Towards a Probabilistic Libertarianism” he acknowledges the libertarians’ problem in “ignoring local bullies” but insists that they are better than allowing a “single big bully” for reasons of risk. Coupling more and more factors into a single fail point allows for massive scale failures that local bullies could never afford. Human social systems are ever-changing and probabilistic. New innovations—in a broad sense of the word which includes norms, technologies, and fashions—are constantly being filtered out or diffusing at a variety of scales within a given social system. Big discontinuities do happen, and are ultimately what drive truly historic changes, such as the spread of modern democratic institutions or the explosion of wealth in the past 200+ years. But bulk of the changes that happen within a society are path dependent, determined largely by how centuries of previous diffusions shaped present institutions. We cannot predict this process of diffusion; a ton of money and brainpower has been spent in a failed attempt to do so for marketing purposes, never mind predicting the larger movements of society. However, we can think probabilistically about comparative institutional arrangements, and what the possibilities and limitations are within each of them. It’s this probabilistic reasoning that has made me weary of libertarians’—or anyone’s–attempt to simply get better laws passed in order to improve our circumstances. Long term, lasting change requires shifting the probabilistic structure of governance. This happened once when the Industrial Revolution gave us what Eli calls the technologies of control—big producers who employed huge swaths of the population in densely populated metropolitan areas. This and the resulting wealth made the rise of the modern central state possible, and highly probable to emerge in some variation across the world. It is for that reason that I also think that libertarians are more likely to affect change byattempting to engineer it, though I’m skeptical of the odds on that front as well. For the most part, I think we’re unlikely to arrive at a better equilibrium except by the same means that we arrived at this one: by chance. Another interesting phrase in the this libertarian’s toolkit, providing a “probabilistic theory of the growth of government”. Institutions like the NSA gained their clout, their budget, and their ability to attract top talent through entrepreneurship; though the creatives energies of this activity are directed rather differently than their private counterparts would be. Robert Higgs described the ratchet effect, whereby the individuals at the head of such organizations sit and wait for opportunities—such as big media events presented as crises—to expand their scope. But you need not buy into any assumptions about the kinds of people that typically run these organizations. Even if variation in governance across history and countries is just a big game of roulette, it’s a game rigged by the ratchet effect. Start with a simple model of institutional variation. Some individuals in public office have their authority and their funding expanded, and some do not. As with private success, it is impossible to tell how much of this success is due to skill and gumption, and how much is due to simple chance. Some of these expansions of authority involved creating new titles or institutions that persisted beyond the life of the individual. Over time, this story repeats; the dice are rolled again and again. Some titles grow into institutions, some institutions gain increasing autonomy from the rest of the government. Those institutions that do not expand, stagnate, those that do, benefit from preferential attachment—and are more likely to expand yet further. From this point of view, the question is not why government has grown so big, but why it did not do so in general prior to the 19th century. Eli favors a technological explanation; and certainly it seems that the tools of mass production and mass media were more vulnerable to central control, and also increased the ability of central governments to exercise their authority across great distances. An addendum to this that I would add is that we simply grew more wealthy—governments are constrained by real resources just as private actors are. More resources in the economy meant more resources that could be captured—and thus the process of variation that generates public institutions could scale up just as the rest of material human life was scaling up as well. Note: I find it plausible that the answer to the “why didn’t this happen sooner” question is slavery and the political dynamic it engendered. Popper understood that adopting rationalism was not itself a rationally-founded choice, but a moral one. He justified this adoption on the grounds that rationalism offered the only path to non-arbitrary decision making. In Popper’s world, it’s either rational debate or chaos, reason-driven decisions or knee-jerk emotional appeals. The reality, as we now know, is that it’s always much closer to the latter. To the extent that there is such a thing as “reason”, it operates very narrowly within the context provided by the people around us and the culture and traditions we are embedded within. Piecemeal social engineering, as Popper envisioned it, has never existed in this world. In a democracy, there are far too many interests involved in any such project, poisoning the well of knowledge before the first drop is drawn. Even in an absolute dictatorship or totalitarian government, holding power is only possible by keeping together shifting coalitions which have interests of their own. Scientific, piecemeal social engineering always devolves into regular old interest-driven, unscientific social engineering. Gurri offers an alternative vision of an open society to Popper’s Voice/Loyalty Open Society, which is a permissionless-default Exit-option society. The “open” in this vision comes from tolerance of divergent practices. Its virtues include increasing the diversification of our practical knowledge, and the simple dignity of treating a citizen like an adult who is capable of making their own decisions. Having a group such as the Amish who live wildly different lives from the mainstream of society should be seen, in light of this ideal, as a point of pride rather than a quirk of a free society. So long as the right of of exit is secured for those now embedded in the Amish communities who may wish to leave in the future. I should standardize my “notes/compilation” post titles. I’m annoying myself. I think while I’m reading some unrelated stuff, I might spend some more time wrapping up some more UpWing/DownWing archiving before I lose that thread entirely, since I’ve already got the requisite notes for them hanging around anyway. I may get back to that next week. People draw constellations out of a mess of stars, telling stories about them in order to remember them and locate themselves in space. We also spatialize time, drawing lines of causation between “seminal events” to identify and locate ourselves in some social sense. note: sloppy, wish I could synthesize it better but the words just sit there. I enjoyed some of the short snippets available in “A History of the Future in 100 Objects“. 6. Enrique decides to undergo an experimental narrative injection therapy. The narrative that wove together and gave coherence to his experiences is modified with original insights in order to improve his view of his own life. After the therapy, he decides he is unhappy with the change. Will reversing the therapy restore him to his original self? 2. Bob fissions, creating an identical clone (Bob2). Shortly afterwards, Bob is discovered to have committed a crime, pre-fission. Who should be held responsible for this crime? Both Bob-prime and Bob2, or just Bob-prime? 3. Cheung signs a contract. Some time later, she performs personality reconstruction. Is Cheung still bound to that contract? Does the nature of the contract, or the result of the contract, have any relevance? 9. Glory is a Rovane-type group mind that meets the conditions of ethical personhood and agency. Glory comprises 245 individuals, but that total may increase or decrease over time. Under what conditions should Glory be considered to have become a different person or to have ‘died’? How do these conditions differ from those applying to non-group minds? 10. Henry is a self-identified fictive otherkin. He wants to permanently remap his personality and senses onto a My Daring Dragon gaming character. What criteria would you use to assess the seriousness of his request? …Which is “atheist” in regards to civil religion, ideas of progress, in praise of the Western Way etc. Everyone should read Ta-Nehisi Coates, forever. In the excellent “Mandela and the Question of Violence“. Judt’s gaze is relentless. He rejects all grand narratives, skewers Utopianism (mostly in the form of Communism), and eschews the notion that history has definite shape and form. States are mostly amoral. In one breath he will write admiringly of the Nordic countries. In the next he will detail their descent into eugenics in the mid-20th century. This is what I mean when I say that Judt has an atheist view of history. God does not care about history, and history does not care about humans. There is no triumphalism, in Postwar, about Western values and democracy. What you see is a continent at war with itself. The upholding of democratic values is a constant struggle, often lost—in the colonies, in the Eastern bloc, in Greece, in Portugal, in Spain. Even among the great Western powers there is the sense that no one is immune to the virus of authoritarianism. Just like with the “narrative injection therapy” from Part I above, the “atheist view of history” is a tidy little phrase that I wish I made up. Multiple opinions- sometimes unrelated or even contradictory ones- being held in the same person at the same time. The person may collapse down onto one opinion as they are forced to contemplate it. Maybe “opinion uncertainty” gets at what I’m trying to describe a little better. Maybe insultingly obvious: Tribal labels can obscure actual belief structures. For example: In American politics there’s an understandable desire to step away from political and other identity pigeonholes. Many American voters call themselves “independents” now, which signals a dissatisfaction with the two-party system. But this label change isn’t terribly likely to change their voting behavior or political beliefs. Further, it creates a new conscious voting bloc, a new group to belong to, with all of its connotations and social burdens. The “independent” voter. Is an atheist really the same as not-a-theist? It should basically be, by definition, but the name atheist creates a group of “atheists”, and that group may be associated with other things than the single disbelief that groups them. Honestly, between the last year that I called myself a Christian and the first year that I called myself an atheist, none of my foundational beliefs changed all that much other than the realization that one designation didn’t interest me as much as another designation. Once upon a time, when state politics were not national business, a republican could be elected in some states that would be considered far more liberal than a democrat elected in other states. I could point out the same phenomenon elsewhere in my life and around me: I identified myself as a rational skeptic for a couple of years, and then eased out of that label- because rational skepticism seemed to be about more things than the one-sentence belief statement of the rational skeptic. Like the Catholic Church between Benedict XVI and Francis, my actual beliefs didn’t change so much as some vague idea of priority and presentation. Now, I did actually change beliefs as I dropped “Libertarianism”, but I held onto the label for a while after the foundations became shaky to me. Although… when I attack a person who has adopted a label (or had one affixed to them), it’s supposed to be easy to find out what that label espouses and attribute all of the arguments and connotations of that argument to the labeled person. It wasn’t true for me but of course other people are simpler than me, aren’t they? This is the Fundamental Attribution Error at work- When I trip, the environment caused it; when others trip, they’re probably clumsy. In negotiation or conflict resolution curricula, we are taught thatinterests (the “why”)inform positions (the “what” that a party might claim to want). Hopefully, steadfast facts and values inform interests. It’s taught that when one hears a position, one should explore the parties’ interests and determine whether there are better agreements available than whatever explicit and conflicting positions appear to be on the table. This is a very useful idea, especially in deliberative business conflicts. However, in social/political situations this doesn’t really seem to be true. This seems to be obvious- politics is tribal and in some respect is a matter of survival (or, if you don’t buy that, at least of evident human importance). Consider a modern politician, who might be in representing a particular known, simple position to appear strong to his constituency or to an interest group. These are “principles” he is expected not to give up on; there are non-negotiable lists and pledges and ratings systems to track his voting record and partisan media to keep watch over his words. His interest is in his standing much more than it is in a particular policy. The arguments and details are not as important as some sense of a power dynamic. The same idea holds in personal social conflicts: oftentimes the egos involved wrangle with each other much more than they do with the situation at hand. Consider two parties engaging in vulgar political debate: Both sides may, if they’ve played this game often enough, create for themselves a whole wall of arguments that point to their same preferred policy (or away from the Other Policy). Even if an arguer discredits a particular argument (and good luck with that by the way, with your obviously discredited authorities and your politicized analysis), our politically conscious defender can readily spring two more arguments in its place, like some kind of hydra. Did he memorize these attacks from talking points somewhere? Probably not- at least, not deliberately. More likely, like most people he doesn’t like to lose arguments- or social engagements of any kind- and he has been rationalizing his own position since he staked it out earlier in the discussion (or before then, in a kinder world). It can be very difficult to pin down positions into solid, clean, (fragile) lines of argument. It’s much easier for both parties, most of the time, to engage each other as two intimidating clouds of pseudo-related arguments, buzzing past each other entirely, speaking different languages and eliciting different authorities and histories and rallying their distinct troops. Generally, this is a dance that can agitate both parties but isn’t really meant to kill anyone. Meh, I’m sure that sometimes it can. People often have to be coerced to narrow themselves down into singular lines of thought, because it costs a lot of energy and (maybe more importantly), it renders their argument mortal, perhaps causing a social threat to the person. You have to talk them down, carefully, you have to lower your voice and open your palms a bit and show that you aren’t looking to hurt them before you can get that buzzing cloud to slow and condense. Then maybe you can look at their arguments and be convinced or maybe even do some convincing of your own. There was a comedian- and for the second or third time here, I’m referencing a comedian whose name and set I don’t recall- anyway, there was a comedian who had a piece about how funny it is that we as Americans are always all about exporting democracy, but it never happens to be our own flavor of democracy that we even pretend to export. This was my favorite Moldbuggism, back when I was digging into his work. My favorite analogy for official authority is the stellar cycle. If the authority of government is the temperature of the star, and the size of government is the size of the star, Washington is easily identifiable as a red giant, like Betelgeuse—enormous and cool. For former libertarians, such as myself, this inverse relationship is critical. The paradox is that weakening government makes it larger. At least, to a libertarian, this seems like a paradox. Once it seems quite natural, you may no longer be a libertarian. Moldbug distrusts our sacred “separation of powers” as a fallacious principle. “The division of authority is simply the destruction of order.” Dividing powers, though, tends to create more overall power, and the branches of distinct powers will try (naturally) to kill each other (“and when they work together it’s as partners in crime,” Moldbug notes). Democracy portends to cut power up but instead it puts power in the hands of those who can form groups, most likely around unsophisticated ideas that can appeal to many. Aside from the reasons Moldbug brings up, there is a problem that I cited regarding kludgeocracy: the American system’s supposed structural libertarian bias creates many gatekeepers in order to limit government action. These gatekeepers, though, can be paid off by having their interests looked after, and so each gatekeeper becomes a toll for any government action. Our system is devised to turn even simple laws into unstable, complex concoctions. The decay in the quality of American government has to do directly with the American penchant for a state of “courts and parties”, which has returned to center stage in the past fifty years. The courts and legislature have increasingly usurped many of the proper functions of the executive, making the operation of the government as a whole both incoherent and inefficient. The steadily increasing judicialization of functions that in other developed democracies are handled by administrative bureaucracies has led to an explosion of costly litigation, slow decision-making and highly inconsistent enforcement of laws. The courts, instead of being constraints on government, have become alternative instruments for the expansion of government. Ironically, out of a fear of empowering “big government”, the United States has ended up with a government that is very large, but that is actually less accountable because it is largely in the hands of unelected courts. Meanwhile, interest groups, having lost their pre-Pendleton Act ability to directly corrupt legislatures through bribery and the feeding of clientelistic machines, have found new, perfectly legal means of capturing and controlling legislators. These interest groups distort both taxes and spending, and raise overall deficit levels through their ability to manipulate the budget in their favor. They use the courts sometimes to achieve this and other rentier advantages, but they also undermine the quality of public administration through the multiple and often contradictory mandates they induce Congress to support—and a relatively weak Executive Branch is usually in a poor position to stop them. All of this has led to a crisis of representation. Ordinary people feel that their supposedly democratic government no longer reflects their interests but instead caters to those of a variety of shadowy elites. What is peculiar about this phenomenon is that this crisis in representativeness has occurred in large part because of reforms designed to make the system more democratic. Indeed, both phenomena—the judicialization of administration and the spread of interest-group influence—tend to undermine trust in government, which tends to perpetuate and feed on itself. Distrust of executive agencies leads demands for more legal checks on administration, which further reduces the quality and effectiveness of government by reducing bureaucratic autonomy. It may seem paradoxical, but reduced bureaucratic autonomy is what in turn leads to rigid, rule-bound, un-innovative and incoherent government. Ordinary people may blame bureaucrats for these problems (as if bureaucrats enjoy working under a host of detailed rules, court orders, earmarks and complex, underfunded mandates coming from courts and legislators over which they have no control). But they are mistaken to do so; the problem with American government is less an unaccountable bureaucracy than an overall system that allocates what should properly be administrative powers to courts and political parties. The solution to this problem is not necessarily the one advocated by many conservatives and libertarians, which is to simply eliminate regulation and close down bureaucracies. The ends government is serving, such as ensuring civil rights and environmental protection, are often important ones that private markets will not satisfy if left to their own devices. Conservatives often fail to see that it is the very distrust of government that leads the American system into a courts-based approach to regulation that is far less efficient than that found in democracies with stronger executive branches. But American progressives and liberals have been complicit in creating this system as well. They distrusted the bureaucracies that had produced segregated school systems in the South, or had been captured by big business interests, so they were happy to inject unelected judges into social policymaking when legislators proved insufficiently supportive. Everyone had his reasons, and those reasons have added up to massive dysfunction. When Congress issues complex and often self-contradictory mandates, agencies are highly constrained in their ability to exercise independent judgment or make common-sense decisions. This undermining of bureaucratic autonomy starts a downward spiral. In the face of bureaucratic ineffectiveness, Congress and the public decry “waste, fraud, and abuse” in government and try to fix the problem by mandating even more detailed and constraining rules, whose final effect is to further drive up costs and reduce quality. The longstanding distrust of the state that has always characterized American politics had led to an unbalanced form of government that undermines the prospects of necessary collective action. It has led to vetocracy. I mean by vetocracy the process whereby the American system of checks and balances makes collective decision-making based on electoral majorities extremely difficult. To some extent, any system that duplicates authority at multiple levels, giving Federal, state and local authorities jurisdiction over whole domains of public policy, risks creating a situation in which different parts of the government are easily able to block one another. But under conditions of ideological polarization, with the major parties about evenly popular (or unpopular) with voters, the constraints become acute. That is where we now are. The government shutdown and crisis over the debt ceiling that emerged in October 2013 is an example of how a minority position (that of the Tea Party wing of the Republican Party) could threaten the ability of the government as a whole to operate. This is why the American political system early in the 21st century has failed to deal with its yawning budgetary problems, among many others. I’ve been reacting to blog posts a lot lately. I’ll be back on the offensive next week, probably.